Hello! I'm Sarah aka Dunno, hobbyist traditional artist living in France. 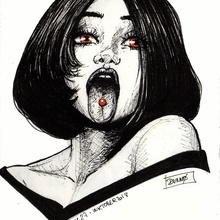 My passion through pen, inks and marker :D I draw since I'm a kid, but it's been 3 years that I'm seriously into it, trying to get better every day. My style is influenced by comic books, dark fairy tales and the female body/beauty/strength.